Public Arrest is the latest in a series of cards where Shadowlands is solely a negative keyword, but Spider cards with Shadowlands get no compensation for carrying a keyword that is only a drawback. Mind, we have much fewer cards with Shadowlands (51 Spider Clan Personalties, 21 of them have Shadowlands) than we used to, back in the olden days of Spider. But it's still staggeringly bad Design to give a Clan a keyword that's only negative and to not compensate them for it AT ALL. 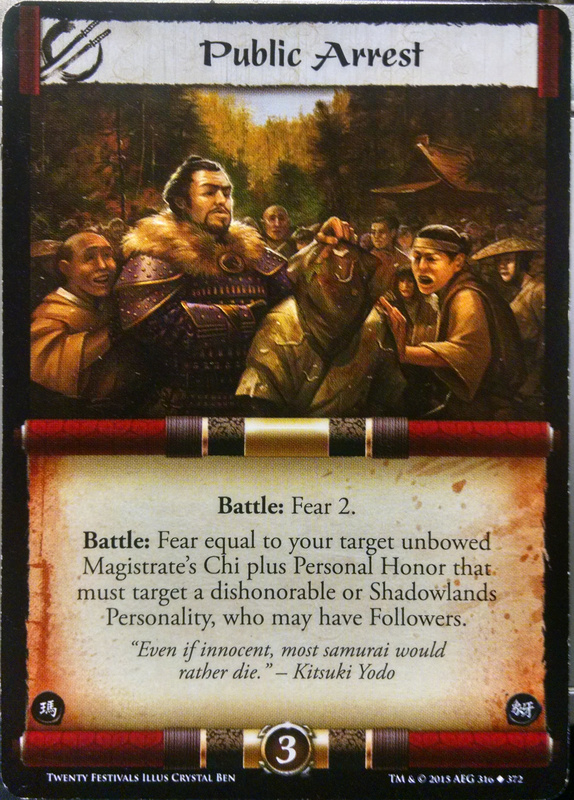 And Public Arrest is probably going to be in Magistrate decks, as it's a strong, STRONG card, usually throwing out around a fear 5+, and they'll have ways, I expect, to dishonor people, so it'll be hitting people beyond Shadowlands Personalities. Here's something to get excited about! HAHAHAHAHAHAHAHAHAHA.... oh, how many shadowland guys do we have? Like seriously... are they TRYING to drive spider players from the game. Sometimes I get the feeling they do, best if they just came out with it tho. I'm just tired of AEG design plan... which feels non existent. of all the stuff they gave us that sucked in the years since breeder, TSL was arguably the last bad thing, so maybe that should give you hope for ninjas! Considering that I have a large amount of cards with Courage in a couple of my decks, I'm not really worried about public arrest. His return is not a surprise, but, I would have expected and mrp to reduce his gold cost or possibly increase his force. Gunjao is essentially Skeletal Troops in personality form. Not super exciting and 2c duelist isn't really scary. Maybe if kensai were on there too? seriously how many themes are they trying to cover for spider? would be super helpful to get the numbers on Daigotsu Kendo and the Kokujin, but even without them we know we have at least one daigotsu left to preview, as well as potentially two more spider clan personalities. off the top of my head i can't recall how many we can expect in a base set but i think we should have at least one more beyond the as yet unnamed daigotsu. I don't think it's QUITE at stuffed as you say, but it is pretty stuffed. You can just lump 'dueling samurai' and 'dueling monks' into a pile together, Spider's going to have a dueling theme, Sahara Sensei pretty much confirms that. Fear is going to be another theme, as it's our shctick, apparently. Won't really be Samurai or Monks, just 'Fear' in general. EDIT: And, as I think about it, Fear is more the overall glue that sticks everything Spider-y together, it'll be prevalent throughout our themes (as it is in our duelers) and a theme all it's own, but it'll also pop up in most of our other things. Susumu is also going to be a theme, as it's our non-military theme. We haven't yet seen a Monksai yet, so we might not actually be seeing that as a supported theme in 20f. And as for Shugenja, they're a tiny subset of support Personalities that will not be numerous enough to qualify for their own theme. We, I expect, will get one every set, or, I suspect, one every couple of sets or so. Just a small handful to tide us over until, in Story, they are established enough to be their own family. So, dueling, Fear, Susumu Honor, Ninja, with the possibility of Monksai. Still a lot, but not as bad as you make it out to be, I feel. Well, if y'all remember The Coming Dawn articles at the beginning of Ivory they described how it works. 1 main theme, this reaches out through all other themes, drawing on all kinds of cards from the clan to represent its core nature. 4 sub themes, each with a sensei. These come out two a year. Spiders main theme is fear, using and abusing the fear mechanic. Spiders from all the themes have abilities that tap into the fear abilities. Subtheme one: monksai with tetsuo. Now, not every card is supposed to fit perfectly with the themes of the year, like Jemaru or kendo. But there are personalities that hailed the themes of the next year, like Shiho and Saido predicting ninja and Atsushi followed swiftly by takahide. This year I would keep an eye out for our conquerers as I'm calling their return in Onix. But we will see. obsidian dojo (2 for 2, bow and destory, target personality, if they win duel fear 4 perm) is okay, and certainly aimed at us. not thrilled to see Lao She. wouldn't have been how i used that last slot. The dojo sounds bad. We have fear aplenty. I'm not sacrificing a holding to give my personality an action they already have. with Lou-Sy spoiled we now appear to have 2-3 personalities remaining: someone between Daigotsu Hachiko and Goju Kumaro along with Kendo (so a daigotsu, a goju, or a monk with a name landing in there), a guaranteed Daigotsu between Atsushi XP and Hachiko, and potentially someone between the end of the scorpion bodies and Atsushi XP (but i wouldn't bet on this). I'm guessing one more goju at least. We have the art for him. I'm really disappointed to see Lao-she back. Cards like Lao-she, Kendo, naibu are so uninteresting and don't really add anything to our established decks nor do i see them opening up new deck options for us. Especially since they just previewed Scour the Unworthy, which bows multiple 4g or less personalities as one action. Regardless of theme, most of our decks run multiple 4g bodies and getting two for oned is going to be such a huge kick in the pants. Their combined force also has to be less than 8, so if you buff their Force, it'll be fine. 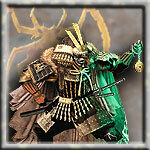 Kendo will be amazing, he is the cheapest conquerer without a drawback that the spider has. Lao- she did work for me last year, she can stay. If only that's what it said. The combined gold of the personalities must be 8 or less, not force. So.... Like 2 personalities, maybe 3? Geisha blitz however is screwed. Wait, having 2-3 personalities bowed to 1 action with 0 cost isn't bad? Most of my battles with swarm come down to a couple points of force in resolution, this card is going to be a blow out. I think that will hurt lion and crane way more then it will hurt us. The Witness token implies that Awed Witness (Bow loser, create 2F/2C samurai personality) is returning as a duel. The Spider Fear dueling may be built around the idea: "Duels hit Personalities, Fear hits Followers(Big Unit) and naked Personalities(swarm)." Duels would work equally well against Big Units, too, depending on the core of said unit. A nasty Kensai with a pair of Chi boosting weapons likely would be a pain to duel. Thankfully those weapons don't protect him from Fear in the same manner of Followers. It all depends of the duels we see really. Awed Witness, Brazen Challenge, Clash of Blades. And technically Defend Your Honor and Show Me Your Stance, neither of which are Spider-compatible. Iaijutsu Open: Your target unbowed Personality challenges a target Personality. Dishonor and permanently remove all abilities from the loser. The winner gains 1 Honor. Full set is up on Oracle. The Twisted One is amazing. It's okay. If straighten is rare, then it's not really necessary (because bowed is bowed). If straighten is common, it's more difficult to time its use to ideal effect.